Wolfenstein is a first-person shooter video game developed by Raven Software and published by Activision, part of the Wolfenstein video game series. 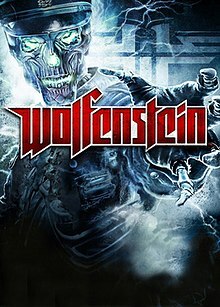 It serves as a sequel to the 2001 entry Return to Castle Wolfenstein, albeit loosely; and uses an enhanced version of id Software's id Tech 4. It was released in August 2009 for Microsoft Windows, PlayStation 3 and Xbox 360, to a lukewarm to positive reception by critics; as well as poor commercial sales, selling a combined 100,000 copies within its first month. This was the final game id Software oversaw as an independent developer, released two months after their acquisition by ZeniMax Media in June 2009. The story is set in the fictional town of Isenstadt during World War II, which the Nazis have enforced martial law in order to excavate rare Nachtsonne crystals necessary to access the "Black Sun" dimension. As the game progresses, happenings in Isenstadt become stranger (military patrols are replaced by supernatural creatures, etc.). Locations include the town's sewers, a tavern, a hospital, a farm, an underground mining facility, a church, the SS headquarters, a dig site and caverns, a cannery, a radio station, a paranormal base, a general's home, a castle, an airfield and a large zeppelin. In an introduction sequence, special agent William "B.J." Blazkowicz steals a medallion from a general on the German battleship Tirpitz. Discovered and captured, he unwittingly unleashes the power of the medallion, which kills all his foes for him. Hijacking a plane from the Tirpitz, he escapes and returns to the OSA headquarters. During a meeting there, he learns that the medallion needs crystals called Nachtsonne, mined only in a city in Germany called Isenstadt, to make use of its full power. The Nazis have begun digging for crystals, led by a general named Viktor Zetta. Blazkowicz is sent to Isenstadt, but his cover is blown by an unknown informant. He then meets up with agents from the Kreisau Circle, a German resistance group dedicated to fighting the Nazis, and with them, makes it to Isenstadt. In Isenstadt, he meets the brothers Stefan and Anton Krieg, who run the Black Market where Blazkowicz can upgrade all of his weapons and powers. (He pays for upgrades with gold earned from missions or found scattered throughout the game.) He also meets the leader of the Kreisau Circle, a former schoolteacher named Caroline Becker and her lieutenant Erik Engel. Becker sends Blazkowicz on a mission into a dig site, where he frees a young Russian named Sergei Kovlov. He also finds an exact copy of the medallion that he found on the Nazi warship, which Kovlov calls the Thule Medallion. Kovlov introduces Blazkowicz to the Golden Dawn, a group of scholars who specialize in the occult, founded and led by Dr. Leonid Alexandrov. The youth also shows Blazkowicz how to use the Thule Medallion. With a crystal provided by Kovlov, Blazkowicz is able to enter the Veil, a barrier between the real world and a dimension known as the Black Sun. In the Veil the player is able to run faster, jump higher and walk through doors which have the Black Sun symbol. Using the Veil, he manages to escape. As Blazkowicz completes more missions, he gains new weapons and new defensive and offensive powers for the Thule Medallion. Eventually, he manages to kill General Zetta, who turns out to be a monster when viewed through the Veil. The Black Market, the Kreisau Circle, and the Golden Dawn then move to a new location in downtown Isenstadt to escape retaliation for Zetta's death. Shortly after the move, Caroline Becker is captured and held in a nearby castle. Blazkowicz helps the Kreisau Circle stage a rescue mission. He confronts Zetta's replacement, Obergruppenführer Wilhelm "Deathshead" Strasse, who is eager for revenge after Blazkowicz destroyed his Übersoldat-program in Return to Castle Wolfenstein. During a struggle, Caroline appears to be killed by Hans Grosse, Deathshead's henchman. Upon Blazkowicz's return to Isenstadt, Stefan Krieg informs him that he has killed his brother, Anton, thinking he was the mole and betrayed both Blazkowicz and Caroline. Blazkowicz then finds out that a Nazi superweapon, powered by Black Sun energy, is about to be fired at the city from a zeppelin that has been hovering over the city since Blazkowicz first arrived in Isenstadt. He boards the airship, where he discovers that Dr. Alexandrov was the real traitor all along. Alexandrov's treachery is rewarded only by an execution at the hand of Hans Grosse. In order to prepare the weapon, Deathshead and Grosse enter the Black Sun through a portal that Nazi scientists had excavated and reassembled. Blazkowicz jumps in after them. In the Black Sun, he encounters Hans Grosse guarding the machine that powers Deathshead's superweapon. Grosse greets him in a mechanical suit outfitted with two chainguns (recreating his earlier appearance in Wolfenstein 3D), and a Thule Medallion identical to Blazkowicz's. Blazkowicz kills Grosse by jamming the Nachtsonne crystals from his medallion into Grosse's. He then destroys the machine, but Deathshead flees through the portal before B.J. can capture him. The explosion takes out the portal and destabilizes the zeppelin, effectively destroying all ways of accessing the Black Sun Dimension. B.J grabs onto a parachute and leaps from the railing. Shortly afterward, the zeppelin falls from the sky and B.J witnesses as it crashes into the distant castle, severely damaging the castle in a giant series of explosions. In a post-credits cutscene, a wounded Deathshead is seen clambering out of the burning zeppelin and castle debris, screaming in frustration. Wolfenstein uses an improved version of id Software's id Tech 4 video game engine, the technology behind Doom 3 and Enemy Territory: Quake Wars. The game was developed by Raven Software for Windows, PlayStation 3 and Xbox 360. The modifications to the game engine include depth of field effects, soft shadowing, post-processing effects, Havok physics, as well as the addition of a supernatural realm, called the Veil. While in the Veil the player has access to certain special abilities, such as the power to slow down time, to get around obstacles that exist in the real world, or even to be able to defeat enemies that have an otherwise impenetrable shield (similar to "Spirit Walk" from the previous id Tech 4 title Prey). The multiplayer part of Wolfenstein was developed by Endrant Studios. Wolfenstein is the first in a string of id Software games not planned to have a Linux port (continued on throughout Rage onwards), with the person in charge of Linux ports at id, Timothee Besset, commenting that "It is unlikely the new Wolfenstein title is going to get a native Linux release. None of it was done in house, and I had no involvement in the project." On the day of Wolfenstein's release, a PC patch was released to address several issues with the online multiplayer component. The multiplayer development studio, Endrant Studios, soon laid off some of its workforce after the completion of the development of Wolfenstein's multiplayer. Four promotional motion comics, each about three minutes long, were released. Each was based on a particular installment in the Wolfenstein series and served as a nostalgic reminder. The first one recreated Wolfenstein 3D's escape from Castle Wolfenstein, the Hans Grosse killing and the final battle against Adolf Hitler. The second was based upon Wolfenstein 3D's prequel game Spear of Destiny, and recreated its final battle, in which B.J. fights the cybernetic Death Knight and the Angel of Death for control of the Spear. The third comic was based on Return to Castle Wolfenstein and recreated the battle with Olaric, the destruction of an experimental V2 rocket and later the final battle against Heinrich I. The fourth comic was based on the Wolfenstein's own cinematic introduction and shows B.J. infiltrating a Nazi battleship and stealing the first Thule medallion. The game received "average" reviews on all platforms according to the review aggregation website Metacritic. IGN gave the game a positive review, though Jason Ocampo said of it, "...you can't help but wish that they developed the kernel of ideas in this game into something more. As it is, this new Wolfenstein comes off as an engaging, if otherwise forgettable, shooter." 411Mania gave the Xbox 360 version eight out of ten and said that it "holds up this tradition of mindless fun, although it doesn't do anything revolutionary." The Daily Telegraph gave the PlayStation 3 version seven out of ten and called it "a game that swings wildly in quality on an almost minute-by-minute basis, and a rather vanilla multiplayer offering doesn't do much to quicken the pulse." However, The A.V. Club gave the same console version a C+ and said that the multiplayer "feels jerky and unbalanced." Edge gave the same console version five out of ten and said, "For all its foibles, Raven's brand of brazen, aimless carnage is a gruesome thrill with just enough dynamism in each battle to keep its anachronistic heart beating." As a result of low sales figures (only 100,000 copies were sold in its first month), Activision laid off employees from Raven Software. The game has been unavailable digitally on Xbox Live, PlayStation Network, or Steam since 2014 for unknown reasons. A follow-up, Wolfenstein: The New Order, was developed by MachineGames and published by Bethesda Softworks. It launched on May 20, 2014 in the U.S. on the PlayStation 3, Xbox 360, PlayStation 4, Xbox One, and Microsoft Windows platforms. The ninth installment takes place during the 1960s in an alternate history world where the Nazis won World War II. Players again take the role of Blazkowicz. ^ IGN staff (May 12, 2009). "Bill Brown to Produce Score for Wolfenstein". IGN. Ziff Davis. Retrieved March 27, 2018. ^ Gilbert, Ben (July 14, 2009). "Activision confirms delay of Wolfenstein to 'week beginning August 17'". Engadget (Joystiq). Oath Inc. Retrieved March 27, 2018. ^ Ocampo, Jason (July 31, 2008). "Wolfenstein First Look". IGN. Ziff Davis. Retrieved July 5, 2016. ^ Kikizo staff (June 30, 2009). "id Software Interview - June 2009". Kikizo. Retrieved March 27, 2018. ^ Besset, Timothee (September 13, 2009). "id Software and Linux". Vox. Vox Media. Archived from the original on September 16, 2009. ^ Spille, Carsten (August 18, 2009). "Wolfenstein Patch 1.1 and Dedicated Server ready for download". PC Games Hardware. Retrieved March 27, 2018. ^ Mitchell, Richard. "Report: Wolfenstein multiplayer team struck with layoffs". Engadget (Joystiq). Oath Inc. Retrieved March 27, 2018. ^ Faylor, Chris (July 14, 2009). "Wolfenstein Motion Comic Continues Wolf History". Shacknews. Gamerhub. Retrieved August 19, 2015. ^ a b Sterling, Jim; Nicholson, Brad (August 23, 2009). "Review: Wolfenstein (X360)". Destructoid. Enthusiast Gaming. Retrieved March 27, 2018. ^ a b Whitehead, Dan (August 21, 2009). "Wolfenstein (PS3, X360)". Eurogamer. Gamer Network. Retrieved March 27, 2018. ^ a b c Bertz, Matt (October 2009). "Wolfenstein: Time Robs Wolfenstein Of Its Charm". Game Informer. No. 198. GameStop. Retrieved March 27, 2018. ^ a b Kim, Tae (August 19, 2009). "Wolfenstein (PS3, 360)". GamePro. IDG Entertainment. Archived from the original on August 22, 2009. Retrieved March 27, 2018. ^ a b Schaller, Kevin (September 9, 2009). "Wolfenstein Review (PS3, X360)". Game Revolution. CraveOnline. Archived from the original on September 12, 2015. Retrieved March 27, 2018. ^ a b VanOrd, Kevin (August 21, 2009). "Wolfenstein Review (PC, PS3)". GameSpot. CBS Interactive. Retrieved March 27, 2018. ^ VanOrd, Kevin (August 18, 2009). "Wolfenstein Review (X360)". GameSpot. CBS Interactive. Retrieved March 27, 2018. ^ a b c Neigher, Eric (August 18, 2009). "The Consensus: Wolfenstein Review". GameSpy. Ziff Davis. Retrieved August 19, 2009. ^ "Wolfenstein Review (PS3)". GameTrailers. Viacom. August 19, 2009. Archived from the original on May 6, 2010. Retrieved March 27, 2018. ^ David, Mike (August 24, 2009). "Wolfenstein - PC - Review". GameZone. Archived from the original on August 27, 2009. Retrieved March 27, 2018. ^ Zacarias, Eduardo (August 19, 2009). "Wolfenstein - PS3 - Review". GameZone. Archived from the original on August 21, 2009. Retrieved March 27, 2018. ^ Sandoval, Angelina (August 18, 2009). "Wolfenstein - 360 - Review". GameZone. Archived from the original on August 20, 2009. Retrieved March 27, 2018. ^ a b Gerstmann, Jeff (August 18, 2009). "Wolfenstein Review (PS3, X360)". Giant Bomb. CBS Interactive. Retrieved March 27, 2018. ^ a b Ocampo, Jason (August 20, 2009). "Wolfenstein Review (PC)". IGN. Ziff Davis. Retrieved March 27, 2018. ^ Ocampo, Jason (August 19, 2009). "Wolfenstein Review (PS3)". IGN. Ziff Davis. Retrieved March 27, 2018. ^ Ocampo, Jason (August 18, 2009). "Wolfenstein Review (X360)". IGN. Ziff Davis. Retrieved March 27, 2018. ^ "Wolfenstein". Official Xbox Magazine. Future US. November 2009. p. 68. ^ "Wolfenstein". PC Gamer UK. Future plc. October 2009. p. 84. ^ "Review: Wolfenstein". PlayStation: The Official Magazine. No. 25. Future plc. November 2009. p. 66. ^ a b Fischer, Russ (August 31, 2009). "Wolfenstein (PS3)". The A.V. Club. The Onion. Archived from the original on September 3, 2009. Retrieved March 27, 2018. ^ a b Hoggins, Tom (August 27, 2009). "Wolfenstein video game review (PS3)". The Daily Telegraph. Telegraph Media Group. Retrieved March 27, 2018. ^ a b "Wolfenstein for PC Reviews". Metacritic. CBS Interactive. Retrieved March 27, 2018. ^ a b "Wolfenstein for PlayStation 3 Reviews". Metacritic. CBS Interactive. Retrieved March 27, 2018. ^ a b "Wolfenstein for Xbox 360 Reviews". Metacritic. CBS Interactive. Retrieved March 27, 2018. ^ Salmela, Mark (September 19, 2009). "Wolfenstein (Xbox 360) Review". 411Mania. Archived from the original on September 23, 2009. Retrieved March 27, 2018. ^ Edge staff (October 2009). "Review: Wolfenstein (PS3)". Edge. No. 206. Future plc. p. 88. Archived from the original on September 5, 2009. Retrieved March 27, 2018. ^ Sung, Lydia (September 11, 2009). "Wolfenstein combined sales barely break 100k". Neoseeker. Neo Era Media. Retrieved March 3, 2015. ^ Callaham, John (September 11, 2009). "Wolfenstein suffers from poor first month sales". GameDaily. AOL. Archived from the original on September 13, 2009. Retrieved March 27, 2018.